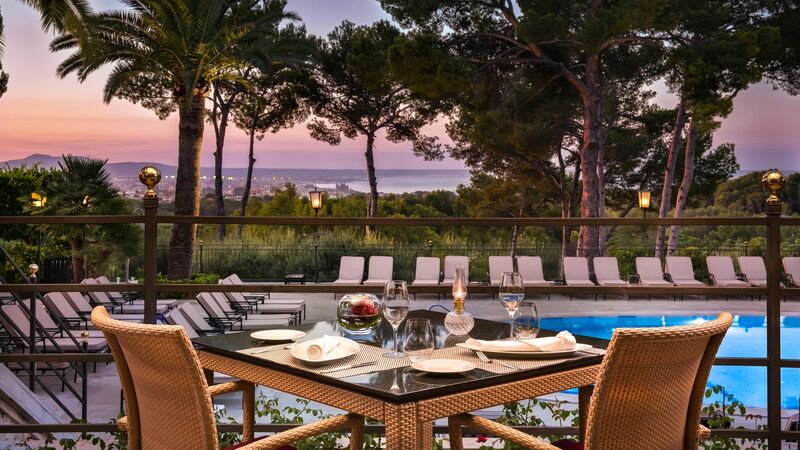 Castillo Hotel Son Vida is located in Son Vida, in Majorca’s beautiful countryside, close to the island’s capital of Palma. As a Luxury Collection Hotel and part of the Marriott group, it offers some fantastic amenities, including an excellent selection of bars and restaurants, and a choice of four swimming pools. Families can enjoy a babysitting service and separate kids’ swimming pools, while adults relax in the sauna, steam room or with a range of treatments at the spa. Choose from delicious Spanish tapas dishes and international dishes onsite, or try cocktails, wines and more in the bars. The nearby golf course and bicycle rental are ideal for those wanting to enjoy the outdoors, while families can enjoy the onsite miniature golf course. 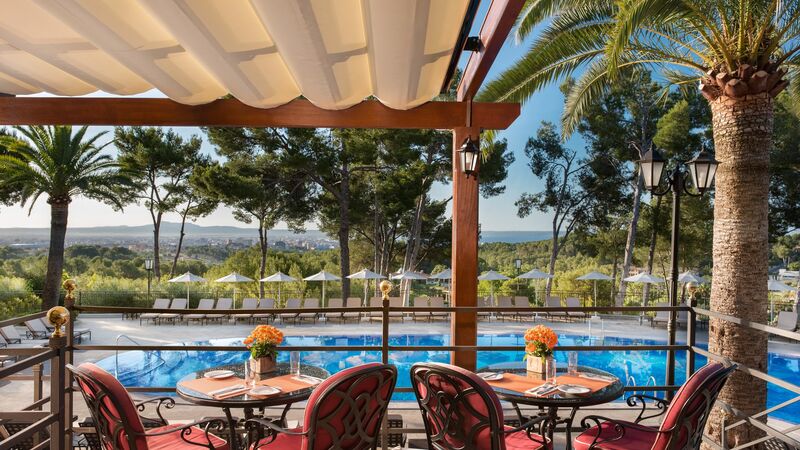 Enjoy delicious traditional Majorcan flavours combined with modern menus full of tasty tapas dishes. You can also choose from a menu of over 400 wines. Enjoy a succulent breakfast buffet full of international and Spanish favourites, with a wide range of dishes served for lunch and dinner. 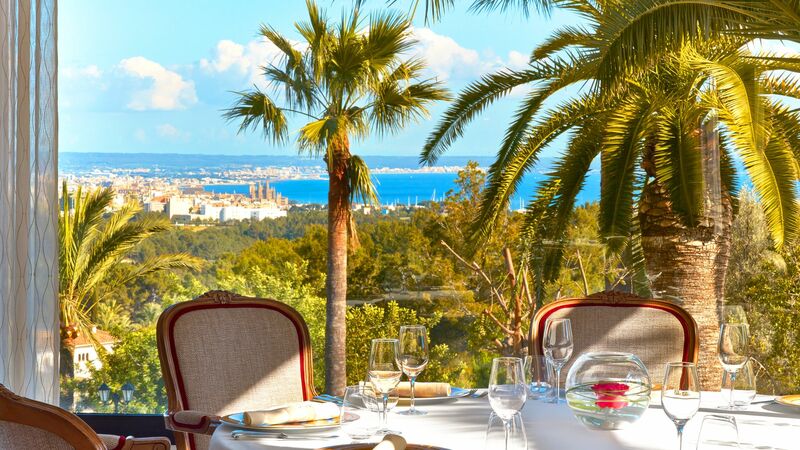 Choose from Majorcan classics or modern global cuisine. Ideal for a snack or refreshment after a day spent in the sun, choose from light bites, snacks and juices at the hotel’s pool bar. Choose from delicate dishes at the hotel’s tea house, where you can enjoy afternoon tea, traditional Majorcan hot chocolate, teas, coffees and more. No bathing suits are allowed in the Salón Real. The Castillo Hotel Son Vida has three outdoor swimming pools, including one just for children and an indoor swimming pool at the spa. Choose from massages, facials, couples’ treatments and more at the hotel’s onsite spa. You can also enjoy use of the heated indoor swimming pool, whirlpool, steam bath, sauna and Jacuzzi. 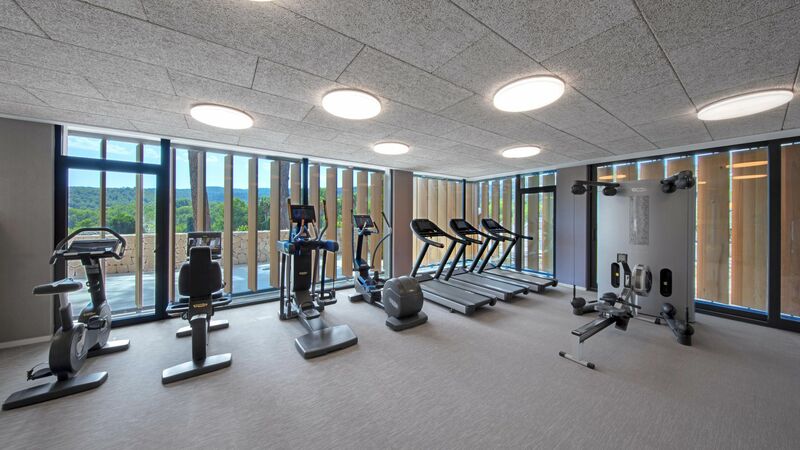 Keep active at the hotel’s gym where you’ll find a range of free weights and complimentary fitness classes. The Castillo Hotel Son Vida offers guests an onsite miniature golf course where the whole family can have some fun. Rent bicycles from the hotel and explore the surrounding countryside and bike trails. Located in the beautiful historic town of Son Vida, the Castillo Hotel is perfect for those wanting to explore Majorca’s countryside and interior landscapes. Those who like the great outdoors will find some excellent opportunities to explore by foot or mountain bike along the mountain trails, and there is horse riding available as well. The town itself has some bars and restaurants where you can enjoy traditional Spanish dishes, and a selection of wines. Golf lovers will find two of Spain’s best courses just minutes away from the hotel, while Palma, the island’s capital, is a 15 minute drive away. The town is home to a variety of shops, historic sights and bars and restaurants which make it perfect for day trips. Choose from one queen size bed or twin beds and enjoy bright, spacious rooms with elegant neutral décor and stylish touches. Large windows offer beautiful views and there is a seating area, air conditioning, minibar, tea and coffee making facilities, a TV and a desk. The marble en suite bathroom has a bath and shower, hairdryer and more. The spacious, elegant rooms offer beautiful neutral décor and a choice of one queen size bed or twin beds. There are large windows with views of the surrounding countryside, as well as a balcony or terrace, seating area, air conditioning, minibar, tea and coffee making facilities, a TV and a desk. The marble en suite bathroom has a bath and shower and a hairdryer. These beautifully decorated rooms have elegant touches throughout, with large windows leading out onto a balcony and a choice of a king size or twin beds. Inside, you’ll find a seating area, air conditioning, minibar, tea and coffee making facilities, a TV and a desk. The marble en suite bathroom has a bath and shower, hairdryer and more. These luxurious rooms have plenty of space to relax and elegant décor, as well as large windows leading out onto a balcony with beautiful views of the surrounding landscapes. Choose from a king size or twin beds, and enjoy the seating area, air conditioning, minibar, tea and coffee making facilities, TV and desk. There is a marble en suite bathroom with a bath and shower and a hairdryer. 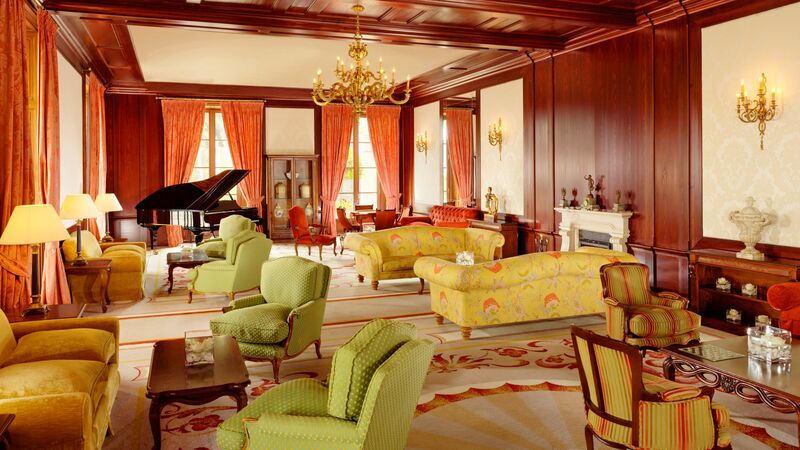 These bright and spacious suites are elegantly decorated throughout and perfect for families. There are two bedrooms, one with a king size bed and one with two single beds or a single bed and a trundle bed. Enjoy a balcony with beautiful views, large windows and elegant décor throughout. Guests can also enjoy a seating area, air conditioning, minibar, tea and coffee making facilities, TV and desk. There is a marble bathroom with a bath and shower and hairdryer, and a separate WC. Stay 4 nights and pay for 3 nights for holidays between 04 November - 22 December 2018 & 02 January - 28 March 2019. Stay 7 nights and pay for 6 nights for holidays with arrival dates between 04 July - 18 August 2019. Children up to the age of 17.99 years will receive a 50% discount on the second "kids" room for holidays with arrival dates between 01 April - 02 November 2019. valid for Classic rooms, Deluxe rooms and Grand Deluxe rooms (excludes Family Suite). Guests staying in a Grand Deluxe Room will receive one complimentary dinner excluding beverages in the Es Vi restaurant for holidays between 04 November - 25 December 2018 & 02 January - 31 March 2019 (a minimum stay of 5 nights is required). Guests staying in a Grand Deluxe Room will receive one complimentary dinner excluding beverages in the Es Vi restaurant for holidays between 01 April - 03 July 2019 & 25 August - 02 November 2019 (a minimum stay of 7 nights is required). Guests receive unlimited golf on one of the Arabella golf courses for holidays between 04 November 2018 - 31 March 2019 (hotel to confirm the first tee time of 18 holes per person per day). Golf offer is not combinable with the Free Night Offer or Family Offer. The hotel is a very nice place to spend some time with the family. The staff is very friendly and warm, the food is of good quality and variety and the rooms are comfortable and cozy. They have a good spa and gym. Try not to be in the rooms above and close to the main door, since it might get very noisy in the evening and night with people standing at the entrance of the hotel while smoking. There was a group in a convention and they had a party the first night. We could not sleep until late because of the people talking and shouting while smoking at the entrance. The hotel compensated us with a dinner. This is a lovely traditional hotel with very professional and friendly staff. The views from the hotel terrace are lovely. Rooms are spacious. Food is excellent - especially the buffet breakfast. Nice spa although we didn?? ?t try the treatments on this visit. Perfect for golfers as they run a shuttle to all Arabella courses. You can park your car at the hotel for free. We are already planning a return visit. Ferran from reception is really good! Very professional staff. I suggest to rent a bike. Great way for active sightseeing. There is company that delivers bike in to the hotel I 30-60 minutes. Going down to the city is painless because you ride down. Getting back is bigger achievement but you can always finish your bike trip in the city and get a taxi for way back. Really perfect place. 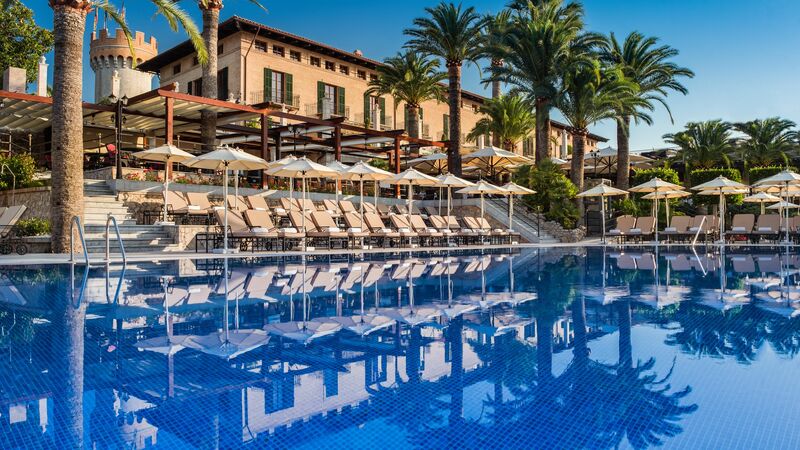 A castle overlooking the bay of Palma, very friendly and helpful staff, excellent breakfast buffet with a variety of everything you can think of, freshly pressed orange juice refilled by the waiters, nice new SPA area. Will come back and bring my family!